KITCHEN – You’ll be instantly blown away by the custom cabinetry, Cambria countertops and attention to detail ranging from cabinet hardware to light fixtures. 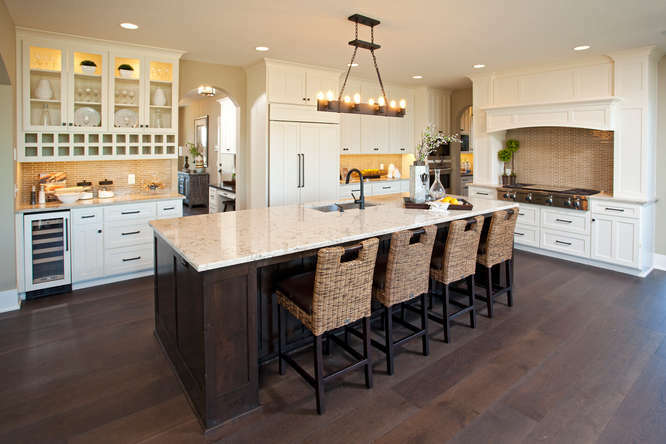 With an 11’ island, massive wood hood and gourmet Wolf appliances, this kitchen is amazing. Homeowners can even wash the dishes while enjoying a fabulous lake view through the wall of windows in the dining space! POWDER ROOM – The main floor powder room has a custom furniture style vanity, Caesarstone quartz countertop and a unique vessel sink. With an eye catching monochromatic color palette, this space adds a nice touch to the ambiance of the home. GREAT ROOM – Coffered ceilings with crown molding will draw your eye as you walk into the space. Floor to ceiling natural stone fireplace surround matching both the exterior veneer and lower level fireplace becomes the centerpiece of the room, complete with built in cabinets flanking each side of the mantel. STUDY – French doors to the right of the entry will introduce you to the study where inside you’ll find striking woodworking details including wainscoting, ceiling beams, and crown molding. Walls and ceiling are both painted with a bold pewter-navy. LOWER LEVEL BAR – Visually stimulating calico floor tile is our favorite feature in this home. Accented with brushed brass finishes in the cabinet hardware and light fixtures, this space adds the perfect touch to lower level entertainment. MASTER BATH – This bathroom is the ultimate getaway. Sliced rock shower accent and floor tile, along with a contemporary free standing tub, evoke natural textures and a serene neutral color palette. This home’s features will leave you inspired. From high quality finishes to unique custom features, it truly represents Homes by Tradition’s level of excellence. CLICK HERE for more details on this home specifically, or find us on Facebook to stay updated on our Parade of Homes giveaways and events!